Part of the creative process for me means that sometimes I just need to let the idea percolate. I've wanted to make my own little Faerie Cottage for some time, I've seen some really great creations, I just needed to wait for...the right idea to come to me. I've made this faerie cottage and the faerie using the wet felt technique of layering feltable fibers, wetting the layered fibers and rolling them up around a foam tube (water noodle) and then rolling the whole wet, soapy business until it felted. 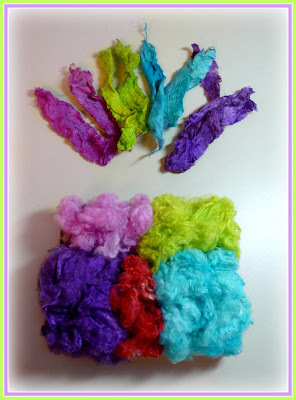 (Here's a tip, when I do the rolling part, I use the top of my washing machine and all the excess water seeps around the washer lid and into the washing machine. It sure saves a lot of clean up!) This created wonderfully textured and sparkly felted fabric. 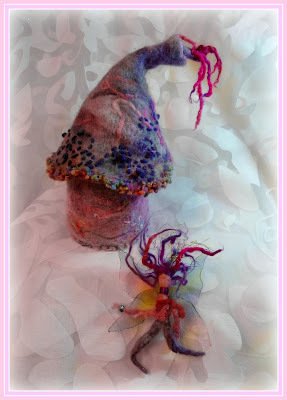 I then needle felted the fabric into the shapes you see here. This is my little Faerie Cottage and Faerie so far. I actually did this back at the end of February beginning of March. For some reason I thought I should have it 100% complete before I shared it with anyone. But I'm looking at it differently now, maybe you will find it just as interesting to see it as a work in progress? 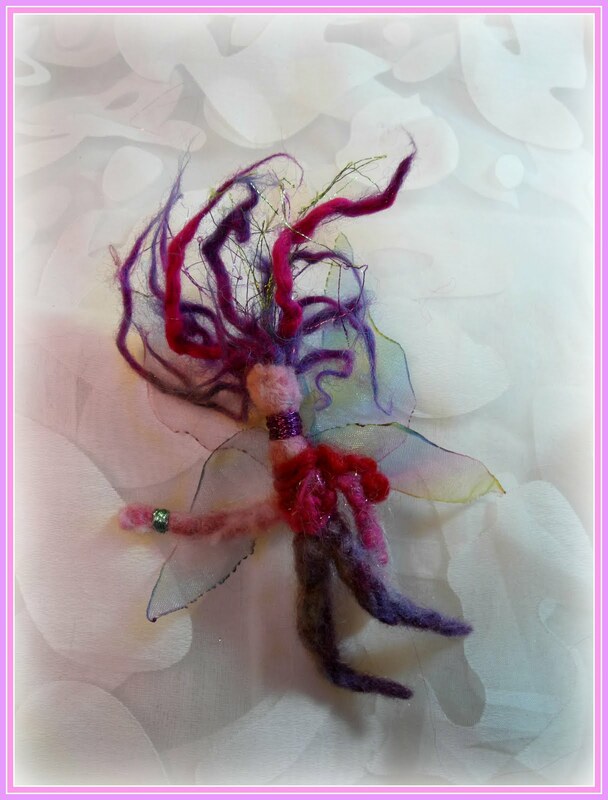 Here's a close up of my wild little faerie, she's a colorful little thing! The roof comes off the little cottage so you can see inside her house. I have been adding embroidered embellishments, with much more planned. I'm picturing an entire felted, magical faerie forest. As things progress, I'll post more pictures. I had a wonderful time at the Michigan Fiber Fiesta last weekend! Last year I was there strictly as a shopper, and this year I brought my Twirly Curly Bird KIT with me. It was so nice to meet all the folks who stopped by to say hello! Then after I got home, it was the perfect time to reorganize my inventory shelves. I had picked up these pretty organizer boxes, now their all nicely labeled with my p-touch. Gosh I love just looking at the nicely organized shelves...I've said it before, I'm a geek for organizing! Now that this has been done and the shop all updated, I can spend a little time working on fun projects, yea! 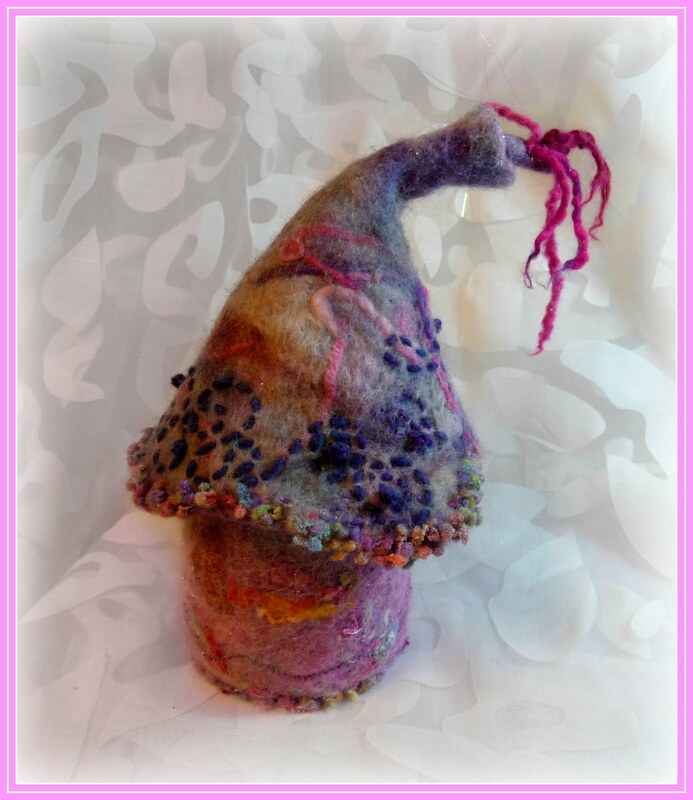 I cast on for a tea cozy last night and I have my fiber for Bohoknitterchic's Harry Potter SAL impatiently calling me from across the room! Hopefully this next week will allow for a little fiber play! I'm making all of this here! 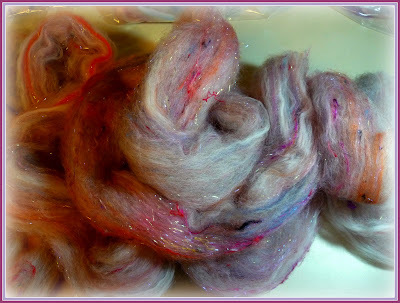 I carded it up on my wonderful Pat Green Big Batt Carder and pulled it into a very beautiful roving. Only six more bags to go! It's even more attractive in the new blended form. 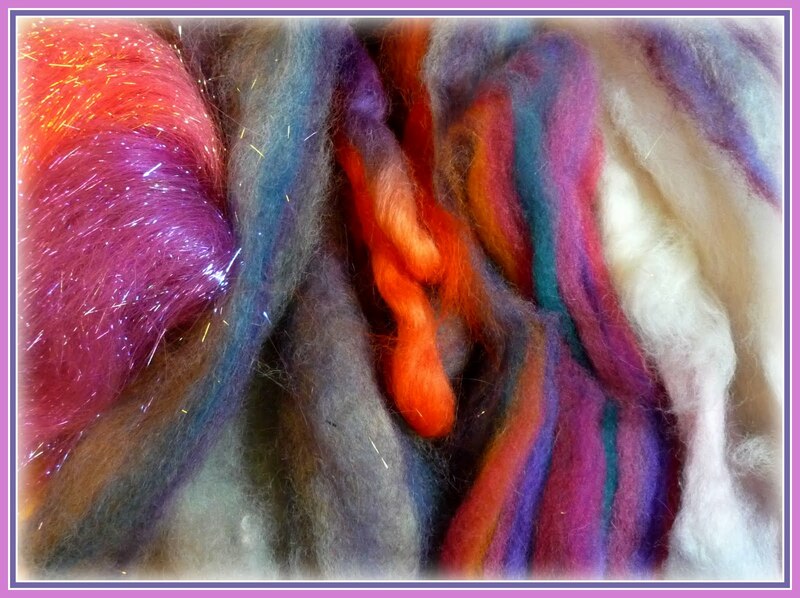 It's destined for the homes of some fibery friends, though I will have to keep a little of it to spin for myself. That's just a little peek at the fiber doings in my studio this week, it's been busy, busy, busy, I love it!